By browsing through the 97 URBACT Good Practice cities one can notice that culture and heritage are given a central role in several of them, e.g. Lisbon is implementing a strategy in order to protect historic shops, Malaga is turning a downgraded central area in a creative district, in Budapest Ujbuda residents are the ones who promote historic buildings through a festival, etc. Heritage management, its connection to tourism and the way it affects the brand of a city makes it an important priority for cities in Greece and Cyprus in their effort to overcome the effects of the financial crisis. For Limassol the city center’s regeneration project was connected to the promotion of its monuments on the basis of wider cooperation between the private, public and voluntary sector; its regeneration has affected the economic performance of the city. Herakleion, a tourist city with an airport that receives more than 3 million visitors, has been working on a smart city strategy that also applies to heritage tourism. By offering a very fast free Wi-fi connection for everybody in the city it allows visitors to use e-guides at their mobile devices (or they can use the Info-points’ tablets) in order to be able to get information, images, etc on the major sites, routes, events, the history of the city, the Minoan civilization, public art, etc. The goal is to allow visitors to visit sites beyond Knossos and the Archeological Museum, e.g. the fortification of the city, old churches, etc. Costis Mochianakis, the general director of the municipality of Herakleion, believes that “the city, by providing the fastest free internet connection in Greece is also providing opportunities for heritage promotion. We are lucky enough to have preserved the archives of the city since 1200, including architectural plans; this means we could easily use new technologies in order to virtually reconstruct the city in different periods”. Austerity measures have inevitably affected expenditure on the heritage/culture sector. How easy can it be for a city to justify expenditure in the culture/heritage sector and what kind of actions should be prioritised? And most importantly how can these actions be inclusive for all the population groups? Four months ago Ι found myself thinking of these questions while visiting one of the exhibitions that were organized in the context of the prestigious Documenta event in Athens, taking some time to observe the visitors. In the newly opened Museum of Modern Art of Athens I couldn’t help noticing that it were mostly foreign visitors belonging to a very specific art crowd that wandered around and only very few locals. This striking fact created quite some controversy and criticism in the Greek media about the event’s organisation: the information was not easy to access, the event was poorly curated, the messages were not obvious; others argued that such an event is not meant to be accessible for a broader audience. Some of the exhibits were indeed very interesting e.g. 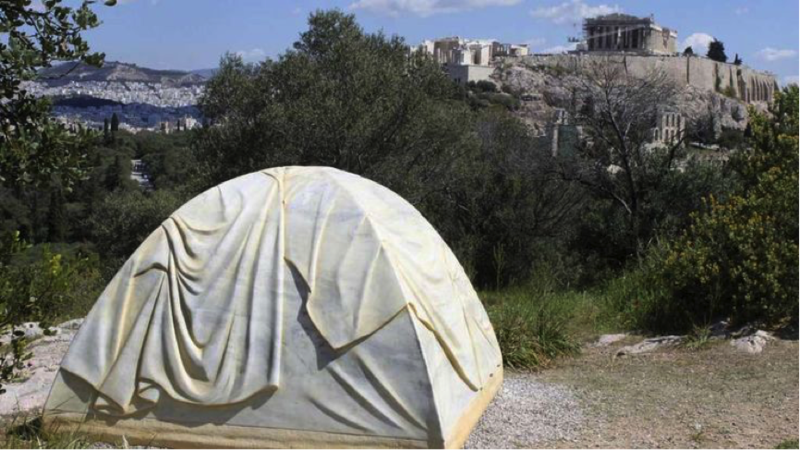 the hand carved marble tent – a comment on the refugee crisis – on the hill on the opposite side of the Acropolis that became an icon of Documenta 14, still the overall reactions to the event were mixed. Making heritage and culture accessible for everyone is a difficult objective. 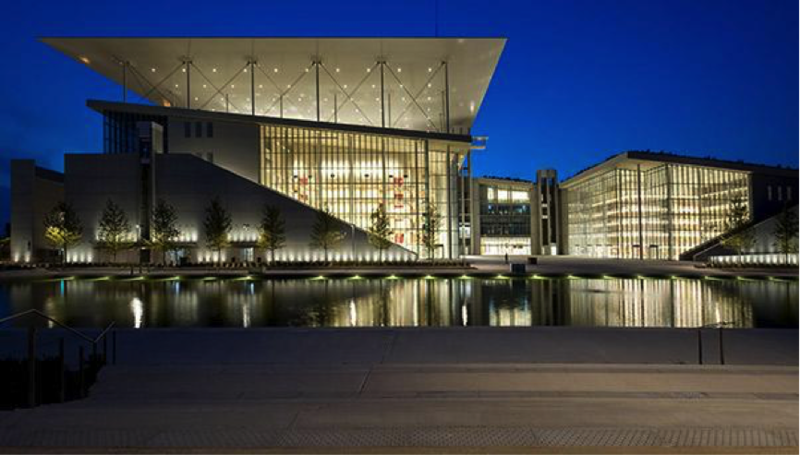 In Athens it was not only Documenta that created controversy this year: the opening of a new prestigious cultural space, the -designed by Renzo Piano- Stavros Niarchos Cultural Center which will host the National Library and the Opera, donated by a private fund to the state was followed by a discussion about the need of this type of landmark projects. Will the daily visitation numbers be high enough to justify the expenditure. It is still too early to say; a daily cultural programme with free entrance and an organized effort for audience development for the National Library are being implemented towards this direction. In many cases buildings with an industrial past are being given new life with the help of culture. As Ivan Tosic points out in his article on the ROG bike factory in Ljubljana this transformations can sometimes be difficult in managerial terms and the national or local authorities need to work within a context that includes stakeholders with different agendas such as artists, squatters, neighbourhood committees, etc. The municipality of Athens is facing a similar dilemma, as the municipality owned historic building of the food market in the neighbourhood of Kypseli has been renovated and is now re-launched as a social innovation / creative space run by a management team that was decided through an open contest; the challenge is to persuade the different groups of Kypseli to participate. This is a case study which is highlighted in the URBACT Refill strategy. Some of the most interesting cases in the culture/heritage sector are related to the experience of one of the EU’s most successful initiatives, the European Cultural Capital of Culture (ECoC). The event seems to be getting more attention as, since a few years, a different selection procedure is followed: ECoCs are not appointed by national governments but selected after a competitive bidding procedure. 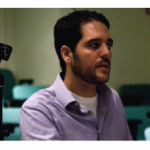 This has led to new ideas, less high brow culture and more inclusive cultural strategies. Matera, the Italian city that will host the event in 2019 and was selected after a strong competition with other Italian candidate cities, is a touristic city with many UNESCO-listed monuments. Within the ECoC’s strategy, citizens become actively involved in cultural planning initiatives, while tourists get “a temporary citizenship” and are treated as locals – as Simone D’Antonio mentions in his blog post. The same idea was adopted recently by Copenhagen within its new tourism strategy with the provocative declaration about “The End of Tourism”. This trend can be related to the problem of tourism overcrowding cities are facing – Barcelona, Amsterdam and Venice being the most characteristic examples- and the efforts to develop an alternative tourism policy model. Within the preparation of the 2021 year and the idea of artistic co-creation with the inhabitants, a common artistic project called Mystirio Kanali was organized in 2017 where the Golden City theater group from Bremen and a local theater group (with the help of a skype connection) allowing locals in both cities to have a main role in the performances. The performances were organized around themes that were connected to everyday life culture and issues both cities face: from food and football to tradition and multicultural societies. Other Greek cities that didn’t win the bid for 2021 like Kalamata, Larisa and Samos have been searching for ways to integrate the actions of their bid books in their city agenda. 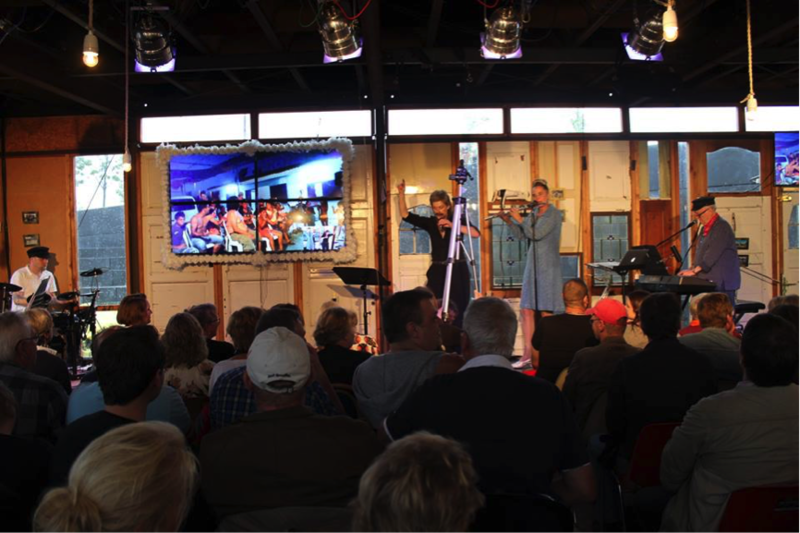 Samos was able to take advantage of the momentum to organise some very successful events (e.g. European Mobility week which includes many cultural activities). Eleni Housni, one of the organizers is very optimistic for the next steps despite the unsuccessful bid; as she says “an extended group of volunteers were eager to help and despite the negative result it is the first time that the cities of the island decide to work on a cultural strategy – everybody sees the positive side of this”. Start by Mapping the Heritage/Cultural Sector and keep updating. Any effort to formulate a local cultural policy needs to be based on dated and reliable data. Learn from other cities. Committing to Networks such as URBACT, World Cities Culture Forum, Eurocities, etc can bring in new ideas. An extended literature and article list can be assessed regarding the cultural economy of cities, heritage management and their connections to the visitors’ economy. Allow citizens to become active both in heritage management (e.g. oral history groups) and contemporary cultural production. Try to combine high brow with popular culture – high profile galleries, opera, etc. should not be the only priority. Experiment with temporary use; empty buildings or abandoned factories can become testing sites for new ideas, partnerships, etc. Work with internal and external stakeholders. Participatory decision making creates the conditions to establish a common understanding regarding procedures. The creative economy depends on unofficial networks and groups that sometimes don’t feel at ease when participating in an official discussion or do not want to feel controlled by an authority. Approaching key persons and creating conditions of mutual trust needs time but it is of vital importance. Do not forget to plan monitoring and evaluating processes. Appointing a managing team or an office for the heritage/culture sector on a city level is necessary. Monitoring the goals and results but also the external conditions on a regular basis will allow the adjustment of action planning.